This marker enumerates at least four times (1599, 1605, 1641 and 1748) that the church was built and rebuilt. The same marked did not mention a church was built when the town was relocated in 1703 (probably not yet called Lumangbayan back then). But it did mention a church destroyed in that location in 1743. 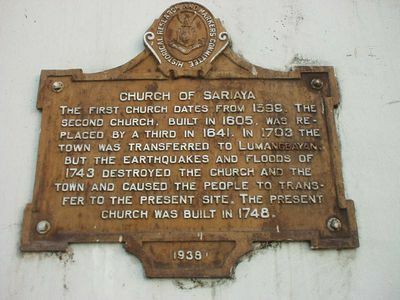 Thus, if the Lumangbayan church could be counted as the fourth (after the 1641 which is third), the present church could be counted as the fifth when it was built in 1748. This marker was unveiled on September 13, 1938 the first day of the then 3-day town fiesta celebrations, with erstwhile Lipa Bishop Alfredo Versoza and Sariaya Parish priest Msgr. Juan Rapenan in attendance. Sariaya and the other towns of Quezon (formerly Tayabas Province) used to belong to the Diocese of Lipa until the Diocese of Lucena was created in the 1950s.